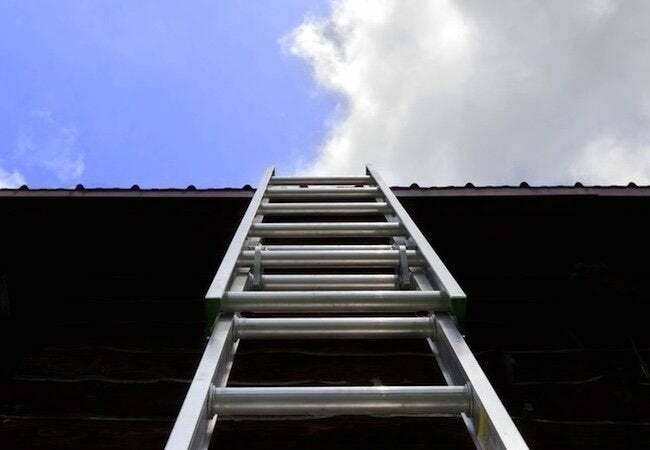 Extension ladders can be more dangerous than useful, if you're not careful, so remember these rules of thumb. For committed do-it-yourselfers, extension ladders are a must-have. When you’re using them, though, it’s important to keep a few safety pointers in mind. First, never try to set up an extension ladder when it’s extended. Instead, position the ladder where you want it, then raise the upper half at least three feet above the roof line. Make sure the bottom of the ladder is angled out about a quarter of its height. Don’t try shifting the position of the ladder, even slightly, while you’re standing on it. Better to make an extra trip down to move the ladder properly. And be sure you stay well clear of any overhead electrical wires when you’re moving the ladder, especially if it’s a metal ladder. Forgetting that could cost you your life. Finally, make sure you don’t position the bottom of the ladder in front of a door that opens outward. Sure, that may seem like a no-brainer, but such mishaps send people to the hospital every year.